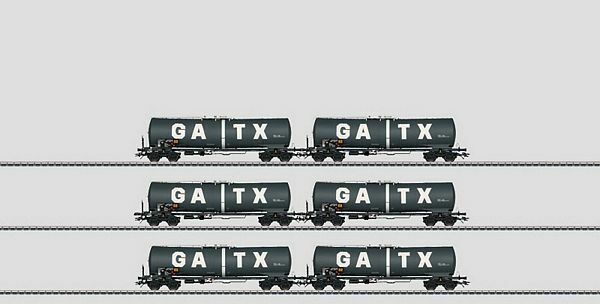 Prototype: 6 different tank cars painted and lettered for the firm GATX Rail Germany Inc., Hamburg, Germany. The cars have non-insulated tanks and a ladder on the ends. Type "Zans". The cars looks as they currently do in real life. Model: The cars have detailed, partially open frames. They also have rectangular buffers. The trucks are the type Y 25 welded design. The cars have separately applied details. All of the cars come individually packaged. Length over the buffers for each car 18.0 cm / 7-1/8. DC wheel set per car 4 x 700580.